UTSC is a recognised RYA training centre and has British Youth Sailing Recognised Club status. The River Thames here is a safe place for people to develop their skills under the guidance of RYA qualified Instructors. We run the RYA adult courses and the RYA Youth scheme dinghy courses as well as powerboat, first aid and safety boat courses. 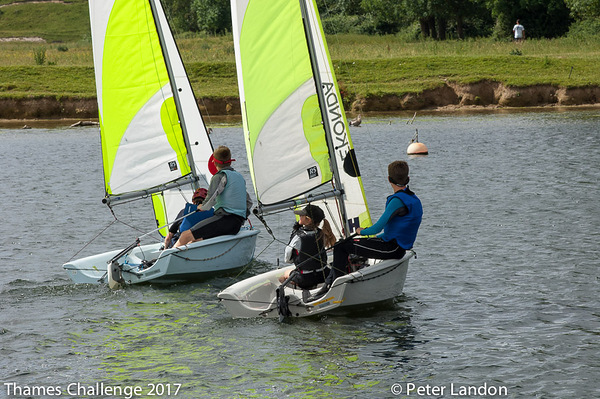 We have a modern fleet of club boats (Optimists, Toppers, RS Fevas and Wayfarers) enabling you to learn and practise on different boats as your skills develop. Anyone who would like to learn to sail, learn to race, try a new class of boat or just improve their skills should consider the training available at UTSC. Our members can also enjoy informal training and fun sailing on most Saturday afternoons and Sundays. Training is intended primarily for UTSC members but we welcome people from outside the club and members of other sailing clubs on our sailing courses for a small additional charge, if there are places available. We encourage and support our members to go on and gain RYA Instructor and Coaching qualifications (Sailing or Powerboat) if they help out with training at the club. Please see the other tabs to see more information on our specific courses. Even if you have never sailed before come and talk to us, as we have StartSail courses each year specifically designed for you. View our training calendar here. Please contact training@utsc.org.uk for any training questions.